Black is an agent for a unnamed Intelligence agency. Black is the only name he goes by. That's what Colonel Tompkins, his boss in the small spy bureau he works for, calls him. That's what his girl friend, the lovely Carol, calls him. A tall, broad-shouldered man who once boxed professionally and still looks like he played a running back in a pro football league, his face has a battered look to it with a nose that was clearly broken and poorly reset and a scar on his chin and one at his hairline. When you looked closely at him, though, one thing that stayed in the memory was the "cold, intense look in his gray eyes." The agency that Tompkins runs is kept a secret to the world. Only a few people in the government knows of its existence or of its agents, though enemies around the world have felt its sting more than once. Its offices are a few blocks from the White House, to whom Tompkins answers, and far away from the other clandestine organizations, which is just as Tompkins wants it. Black is in his mid-30's and is in the peak of condition. He needs to be because the kind of jobs his boss sends him on would kill most men. Black is not the only agent that Tompkins has to call upon but he is considered the dean of the operatives and it is usually Black that gets the hardest assignments. Black is a quiet, still man who would rather not talk unless asked a question directly. He often appears aloof as he spends more attention to his surroundings than most, making it seem as though he was not listening. Even more important than his attention to detail, though, was his ability to think. 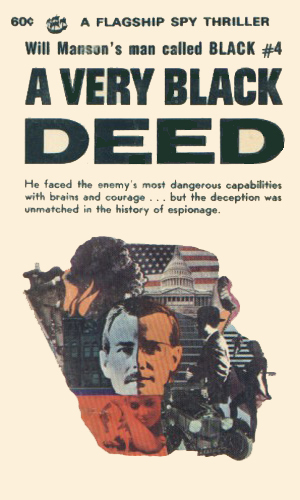 Black seldom entered into a room without knowing an exit or started a mission without a plan of action and, when that plan went awry as plans always do, he was able to quickly devise another. That was why he had lived through as many assignments as he has with as few physical reminders as he does. 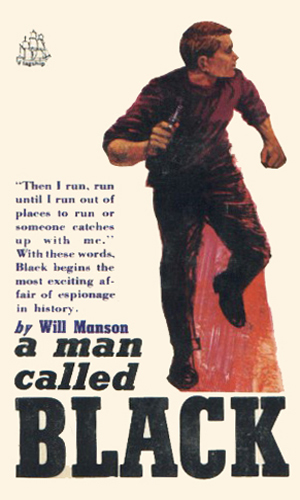 There were two other books written by Mr. Manson that came out at the same time and have been listed as part of this series, The Duke and A Deadly Game but I have seen the former and read about the latter and they do not belong. All evidence pointed to Black's having been sold out by his boss, left to be tortured and killed for reasons Black never learned. If it hadn't been for the lovely young lady he happens to run into, Black would be dead. Now both are being hunted. 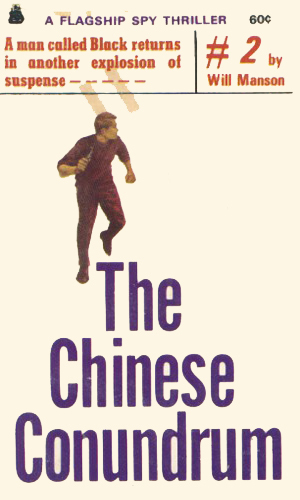 An American newmans just back to Hong Kong from inside Red China is murdered. He was carrying a message of great importance. Black is sent there to find it and get it back without being killed himself. Even on vacation with his love, Carol, Black can't stay out of trouble. Finding a horde of money in a secluded spot, Black keeps investigating until he uncovers a plot to enslave thousands of people. Black is directed by the Colonel to find the traitor in the department, orders passed just minutes before an explosion in the building severely wounds the Colonel and sets Black on a trail of vengeance. At the risk of sounding more derogatory than I mean, this 4-book series is a Nick Carter wannabe. It came out a couple of years after Carter got started, the mid-60's. Bond was quite popular by then, of course, but the feel is closer to Carter than to Bond. That being said, I like this series. I admit often how I love B-movies and that love extends to B-series. Still, they are fun. Black says little and there is virtually no bravado from the man, unlike other series of its type but he speaks volumes in action when pushed. So he makes for a fun agent to watch the bad guys make him mad.